The scene is set in upper suburban America in the year 2022. Crime and unemployment are virtually nonexistent. The economy is flourishing in unprecedented fashion. And everywhere you turn, ordinary faces are masked by an almost sadistic grin that is portrayed as cheerful contentment. What do those factors say about the United States of the very near future? Under the rule of an entity enigmatically referred to as the “New Founding Fathers,” an alarming new legal trend has emerged: once a year for 12 straight hours, the citizens of the states unite in an event referred to as the “Purge,” and are allowed to partake in an entire night of unrestricted bloodshed on each other. What could possibly warrant this annual legalization of such heinous possibilities? The nation’s prosperity, they say, speaks for itself. And underneath that logic is a chord of very cynical psychology, to boot: if man is indeed destined to be violent and monstrous, then it stands to reason – at least in the eyes of those high up – that giving them one free pass a year to “unleash the beast” will inevitably make them much more civilized people to deal with for the other 364 days of the year. 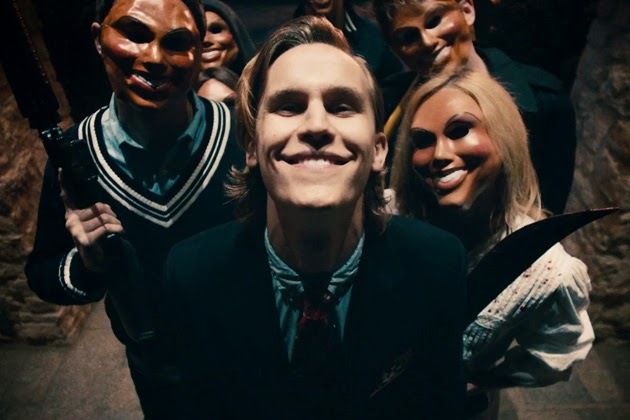 “The Purge” is about those twelve hours of anarchy, as told through the perspective of one wealthy family in the hills that anticipates being able to quietly observe the events from the safety of their secure mansion. Unfortunately for them, they are the kinds of characters ripe for the chaotic foreshadowing of horror films. In the early scenes, the signs are obvious: we meet James Sandin (Ethan Hawke), a security specialist who has made a fortune selling a high end system to all of his wealthy neighbors, and his tranquil wife Mary (Lena Headey) winds up exchanging uncomfortable platitudes with one who gawks at her lavish house with admiration interlaced with vexation (“everyone says the neighborhood paid for that new addition”). Their children, meanwhile, quietly wrestle with their own wonder, directly related or otherwise: teenage Zoey (Adelaide Kane) is concerned that her much older boyfriend will never be accepted by her father, and young nerdy Charlie (Max Burkholder) exhibits some level of detached fascination for the annual national tradition while tinkering with inventions (his most important: a mutilated doll on wheels containing a camera device that connects to a pair of sunglasses). Among the four, the dialogue touches on the reality of their situation with no sense of farsighted intrigue. James and Mary accept the Purge as a means to keep the nation prosperous, essentially because it has proven successful to the livelihood of the victors. Charlie, so driven by the purity of youth, does not fathom the necessity in a human being to murder someone else. When they openly discuss the event during the initial lockdown, the discord between the kids and the adults is almost impenetrable, and they each go to separate corners to wait out the twelve hours like rats attempting to go unnoticed in the shadows. And then a series of grim circumstances rouse them to the forefront of unwilling participation. Charlie, who catches a glimpse of a young black man pleading for help just outside the gates, is caught in a moment of foolish sympathy and overrides the security system to let him in. Those who were pursuing him – a group of educated but depraved teenagers led by a smarmy socialite (Edwin Hodge) – track him down to the mansion and threaten the Sandins with an ultimatum: either they return the man they are harboring, or all of them will be murdered in cold blood over the course of the night. And if that all isn’t enough, Zoey’s ever-so-eager boyfriend, still reeling from James’ rejection of their relationship, sneaks into the house to “talk” to her father and winds up instigating a tragic gunfight just as these events converge in the dead of night. There are thousands of written rules in all films of this nature, but at long last comes a new one for inclusion in the handbook: in a universe where it is ok to murder without regard to consequence, it’s not exactly a wise idea to refute the eager boyfriend of your teenage daughter. Of course all of this occurs within the context of a much broader sense of considerations: namely, why has such a deplorable event been allowed to go on in the public awareness for so long without any sense of challenge? To answer that question with assuredness is to diminish the acknowledgment that humanity has reached a state of awareness that forbids such anarchy, and a movie would never exist otherwise. But “The Purge” dwells in some form beyond the narrative foundation; it is an idea movie where details, characters and motives are irrelevant, because collectively they embody the crux of an argument that is as fascinating as it is singular, and made all the more potent by the fact that we find some level of validity in the details without them becoming an exercise in ideological futility. As such, the family at the center of the action is not so much a group of potential victims as they are the embodiment of one last semblance of free will in a world that has stifled challenge and thought. That they have made it this far without their own lives being threatened – or lured by the instinct to kill on their own, furthermore – is obligatory; in a story about chaos where the heroes silently advocate the decisions of their government, they are not doing so necessarily because they genuinely believe in them, but because it is easier to accept the rules as long as they don’t directly affect their own routine. You know that, I know that, and thankfully writer/director James DeMonaco knows that too; his film is an effective balance of mood and style, not overburdened by grotesque displays of violence but suggestive enough to create a space of believable bleakness that warrants our continued interest until the very last frame. True, almost none of the plot itself is plausible from any angle – the very idea that a world like this could exist in any civilized manner is absurd, as are the notions that a whole society could accept the purge as a legitimate enforcement of democracy when it clearly is just a ruse to do destroy the low end of the class system. 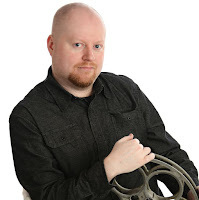 But to deny that the premise had a very notable effect on my awareness would undermine the fundamental purpose of the movie, which goes to the heart of the Alfred Hitchcock doctrine: plausibility in a thriller is ultimately irrelevant if it successfully stirs your deepest emotions. “The Purge” is no kind of rousing masterpiece and is probably way too short of a film to ever really get to the bottom of the intricate arguments it brings up, but for 86 whole minutes I was paralyzed and captivated by every little detail, and afterwards still had enough curiosity to wonder just who those deplorable “new” founding fathers were that set this all into motion. You should never be allowed to review a movie again. This movie was horrendous. It had no redeeming qualities. The whole premise is idiotic, to start with. I could go on and on about the stupid actions of the characters and the huge holes in the plot, but it would take as long as the movie. If you didn't hate this movie, you don't deserve to ever review again. Carole Cody, you should never be allowed to comment on a review of a movie again. Your comment has no redeeming qualities and your whole premise is idiotic to start with.